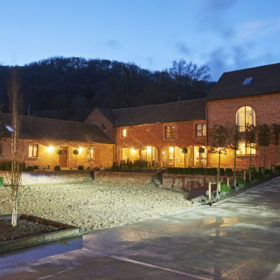 Among the hops, orchards, vineyards and country pubs of the Malvern Hills sits Fairoaks Farm. 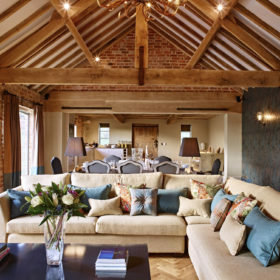 Amid 300 acres of soaring beauty, oak floors and exposed stone walls, all is peaceably sleepy. Relax flexibly with family and friends in four-barn permutations, walk the trails, light the logs, check in and check out awhile. 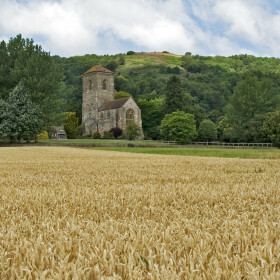 Beneath the high ridge of the Malvern Hills sit hops and orchards, vineyards and country pubs. 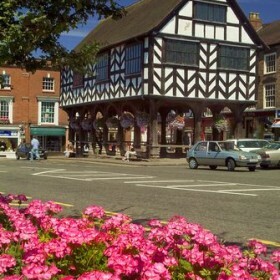 In Ledbury, with its timber-framed buildings, cobbled medieval streets and towering spire of St Michael’s, all is peaceable and sleepy. Follow the winding lanes past tree-rich escarpments to Fairoaks Farm. 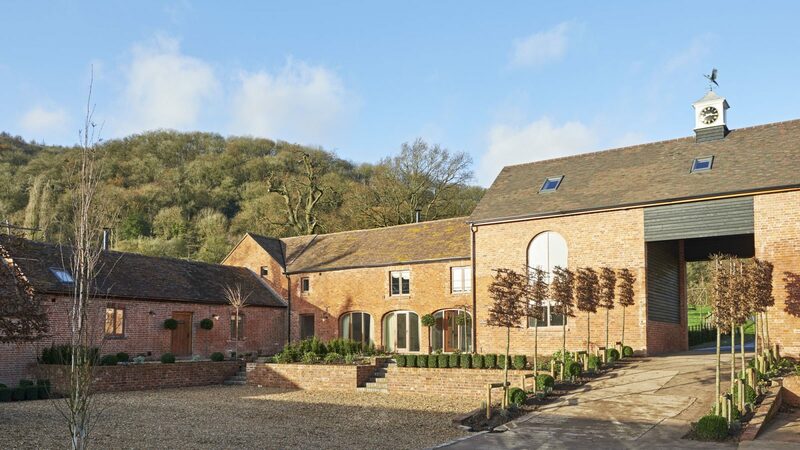 The four new holiday barns sit within a 300-acre chunk of Herefordshire and Gloucestershire. 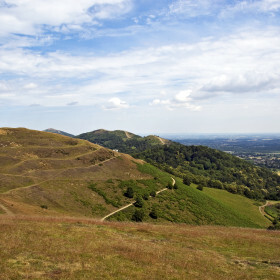 The Malverns rise majestically in the distance, officially and sentimentally an Area of Outstanding Natural Beauty. But Fairoaks is special, too. 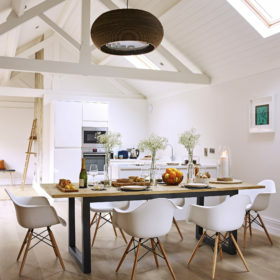 Oak floors, exposed stone walls and a homely feel see to that. 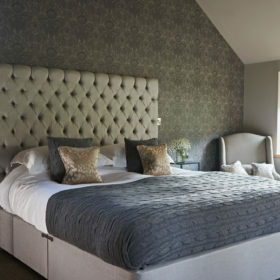 Book one for a cosy foursome; book all four for two dozen family and friends, or book anything in between. 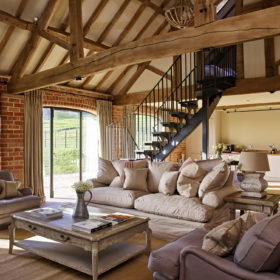 Five-star Fairoaks Farm is flexibly relaxing. Sink into rolltop baths, pad across heated floors, chill in private gardens, or walk the trails then curl your toes in front of burning logs. 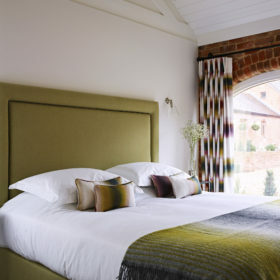 At Fairoaks, cosy is just the beginning. 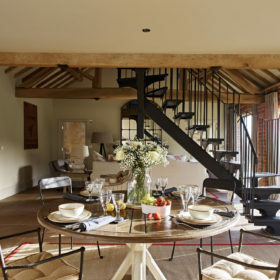 Sugarloaf Barn sleeps eight in large and lavish luxury, with views panning away to the Cotswolds. 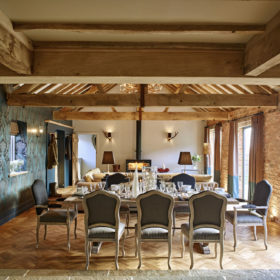 The eight-bed Stables is rustically French, yet spectacularly modern, and Midsummer Barn and Hollybush Barn are fabulous for foursomes looking to escape this world awhile. The only wild time you’ll find here grows along the forest trails. 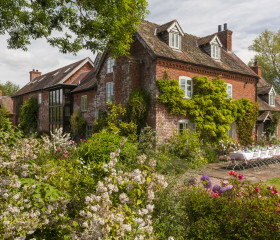 Snatching a green and glorious chunk from England’s best-kept secret – the wilds of Herefordshire and Gloucestershire – Fairoaks Farm is a luscious spread of lawn and a fabulous tangle of trees and trails. 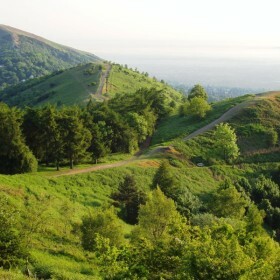 One that leads nowhere and everywhere all at once across the lower reaches of the majestic Malvern Hills. The four barns at Fairoaks share 300 acres but privacy is key: each has a private garden, a lawned and manicured sanctuary seemingly designed for you alone. Somewhere the breeze rustles the leaves and a skylark sings as your steaks sizzle in the open air. Peace reigns in the rural hush. Nothing says welcome like a hamper, toiletries and a basket of chopped wood. 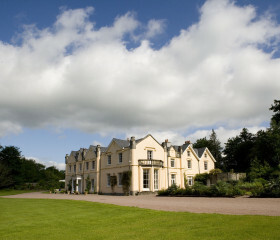 Get comfy, light the logs, pour a drink and fire up a film night on the wall TVs. 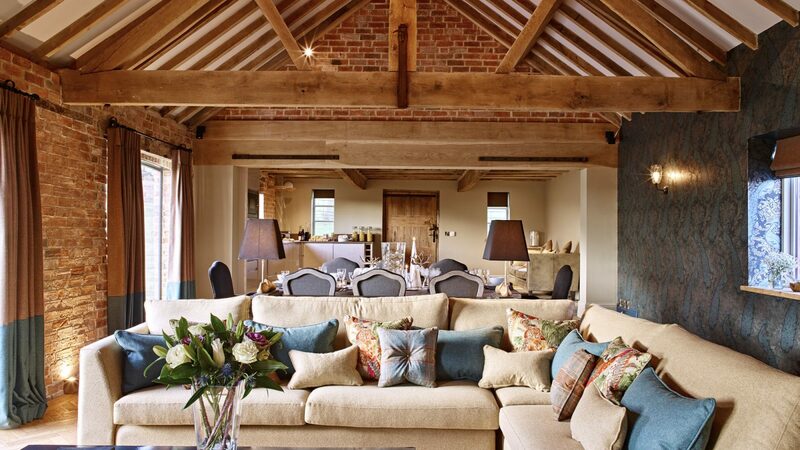 The living area in Sugarloaf Barn seats 12 above its heated floor and the BOSE stereo adds a soundtrack to go with the Cinemascope views. Free wifi floods the space. It’s a similar story in Midsummer Stable, with a slightly different flavour. 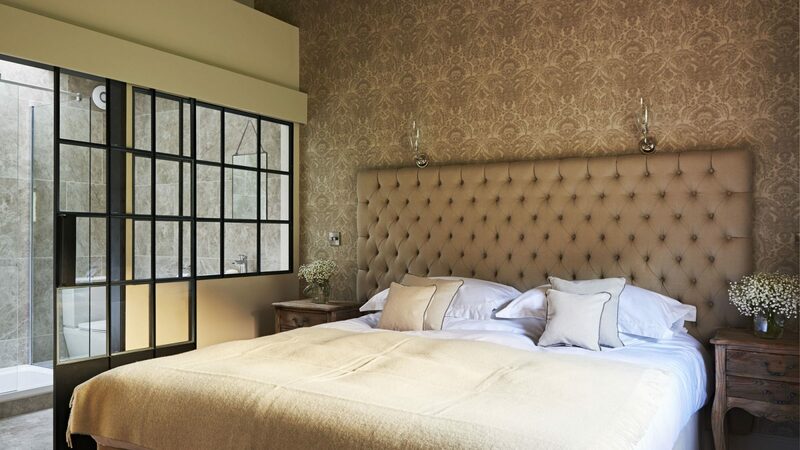 Heated floors are parquet, views are floor-to-ceiling, tiles are fired earth and the lighting’s smart boutique. Fixtures and fittings have a rustic French feel. What better excuse for croissants and coffee in the morning, and brie baguettes and wine in the evening? Midsummer Barn continues the French boutique theme. Pad across the heated floors, light the logs, break out the popcorn for a movie night, or just curl up with a paperback in front of the floor-to-ceiling windows that invite the views in. 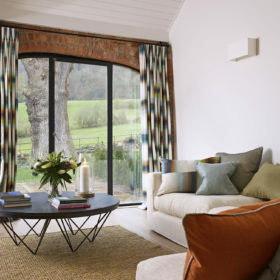 No one had it as good as at Hollybush Barn, a relaxed, contemporary space with a Scandinavian feel. Catch a movie, burrow down with a book, or just sit and stare at the escarpment from the sitting room. The barns at Fairoaks are a chill pill for your soul. 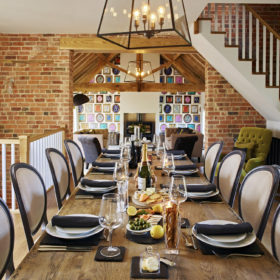 There are state-of-the-art appliances and coffee on tap in the open-plan kitchens and space for eight or more in each barn to drink and dine. Tuck into the welcome hamper, chop and chat, get creative in the kitchen. Or let us do it for you. Put your feet up, pop a cork or two and call up our chef. We’ll pop our whites on while you settle back on the sofa with some liquid refreshment. From a one-off celebration to a fully catered break, we’re happy to step in and get all gourmet. Eating out? Bites and beers are well catered for here. 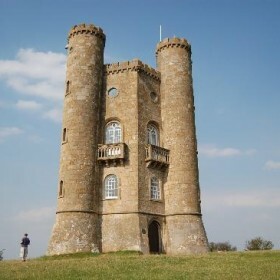 Make a pub trip part of a mini-ramble with built-in reward at The Hanley Swan or The Inn at Welland, where Parma ham or buffalo mozzarella often come with a side order of jazz. 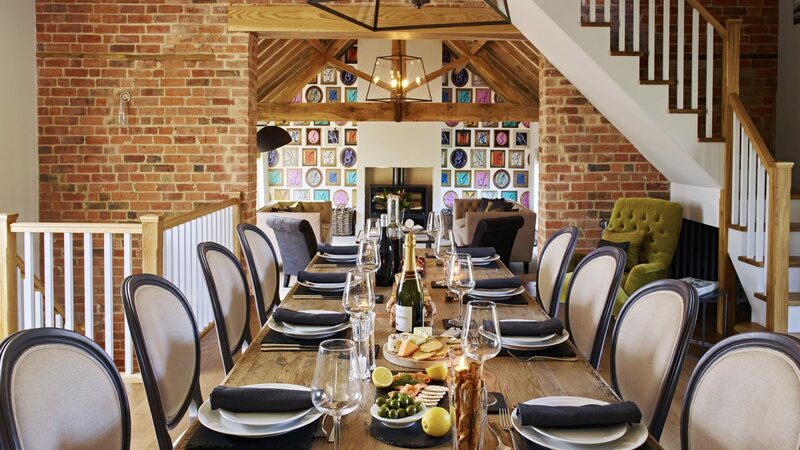 Eat at England’s oldest inn at The Porch House on Stow-on-the Wold, potter beautiful Ledbury, then drink and dine beneath hop-clad ceilings at The Feathers in Ledbury. 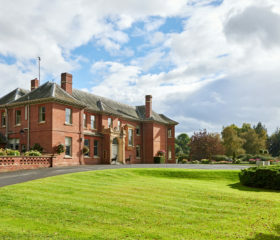 At The Cottage in the Woods in Malvern, fillet of Cotswold beef and herb-crusted hake come served with 30-mile terrace views across the Severn Valley. The four barns at Fairoaks Farm sleep 24. 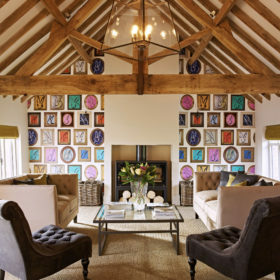 Sugarloaf Barn and Midsummer Stable sleep eight; Midsummer Barn and Hollybush Barn each take four. 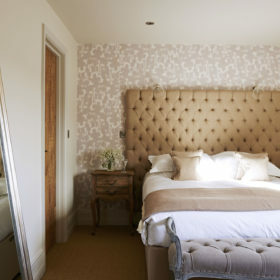 We leave the permutations and the protestations up to you, but unabashed luxury runs throughout in rolltop baths, capacious beds, luxury en-suites and walk-in showers. 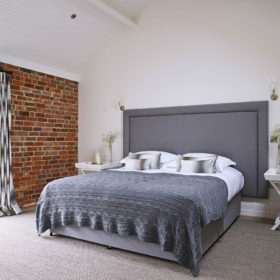 Sugarloaf Barn comes with four large bedrooms and three large bathrooms. The master bedroom’s walk-in shower room comes with rustic Italian tiles and a rolltop bath. The ground-floor double can convert to zip-and-link or singles if preferred. It shares a Jack and Jill bathroom with the other double. The final double comes with separate shower room. Whichever you choose, the effect’s the same: that escapist feeling that washes over you in the finest spas. In luxury bedrooms, you’ll sleep like the logs that line the nature trails across the Malvern escarpment. Open the window for pure country air and to doze off to the sound of the night-time breeze through the trees and the hoot of an owl in the copse. 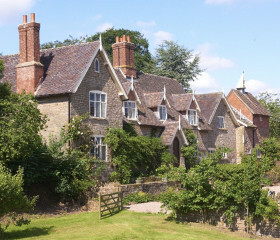 Potter the cobbles of ancient Ledbury, walk the Malvern ridge, or see the babbling Cotswold brooks at Broadway and Winchcombe. 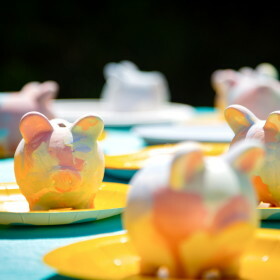 Kids can get their skates on at Ice Quest Malvern, paint pots at Green Frog Pottery or solve the clues on the Malvern Hills Spy Mission Treasure Trail. There’s no mystery to having a good time here.